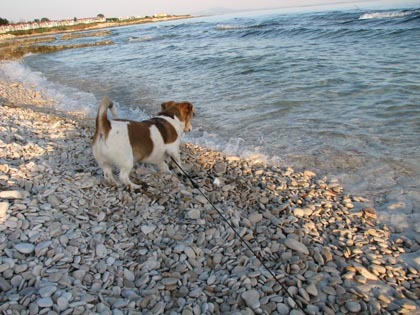 And A Small Dog — Travel Advice For You and Your Dog - Pets Need Vacations, Too! Welcome to AndASmallDog.com - the site dedicated to providing accurate travel advice and information for you and your dog! I am a travel agent who specializes in pet travel. Have a look around and let me know if I can be of any assistance with your next trip! Just email me at Leila@WorldClassTvl.com to receive personalized assistance with all your pet travel plans! Hello AndASmallDog followers! I know I have been quiet (except my rant about KLM losing our dog) but that doesn’t mean I haven’t been traveling. In fact, we’ve been on the road a lot of this year – first NYC, then Europe (Belgium and Holland this year), followed by a week in South Florida (the Keys and Miami). We’ve settled back home for a while until it starts again in NYC in March! Of course, Bodie comes with us on these trips. We also took him all over France last year including the Loire Valley, Bordeaux and Burgundy areas. 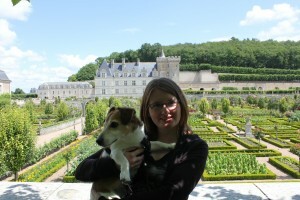 He got to explore the beautiful gardens at the Chateau de Villandry, see the cute castle of Chateau de Chennonceau (from the outside only), drive around the famous wine regions all over France (think his favorite part), visit the Armagnac distillery… Ooh la la! We stayed at some gorgeous pet-friendly properties including in the prestigious wine town of Puligny-Montrachet. In Belgium, we did our own self-guided brewery tour. We lost count of how many breweries we visited but it was at least 12+! He wasn’t allowed inside the breweries but we’d leave him at our vacation rentals while we went in. Or just did a quick visit while he slept in the car (weather was cool enough for us to do that!). He really doesn’t care where he is though as long as he is with us. He loooooooves being in the car and will sleep on our laps on the long journeys. I’m glad that he is so good about that! Anyways, I am here still to assist you with your next vacation – whether you are taking your pet with you or not. AndASmallDog.com is my “pet project”. I have a couple other sites including GoYourOwnWayTravel.com (my main hub) and WineBeerTours.com (food/wine/beer travel). Feel free to check them out as well! They are the reasons why I have been quiet on here. Plus I’ve been busy helping my clients travel! My husband and I always choose to fly with KLM on our annual month-long trips overseas. We always take our dog with us and have flown with KLM with no issues at least a dozen times. We even drive 6 hours to the nearest airport so we can fly with them. And when clients ask me for airline recommendations why taking their pets to Europe (or beyond), KLM has always been at the top of my list. So when we landed in Amsterdam about two weeks ago, we did our usual routine: my husband went to the regular baggage claim belt and I went to the “odd-size” baggage area where they hand deliver the pets. It was a longer than usual wait for our regular luggage. They kept announcing the bags were coming but then nothing happened. So it didn’t seem that odd that our dog wasn’t there yet either. I asked a KLM attendant and she said he’d be the last thing brought over anyway (which in previous experience, isn’t necessarily true. 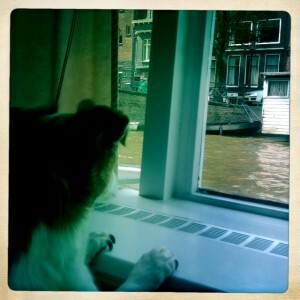 They usually bring the dogs out quite quickly in Amsterdam). After about 30 minutes of waiting, our luggage finally arrived. But still no dog. After about 45 minutes, and when it was apparent that all luggage had been delivered, I waited in line at the KLM services desk in baggage claim. I was getting very anxious as minutes were passing, and still no dog. I confirmed with the representative that all luggage had been delivered and asked how much longer until we get our dog. She made some calls on a phone and radio and told me to wait at the odd-size luggage area and to check back in a while. I went back to the desk about 10 minutes later and she looked concerned. She told me they didn’t know where our dog was. I asked her to explain, and she just repeated that. She said she was waiting for a colleague to return her call. We had confirmed, as we always do, that our dog was on the flight before we even departed from the US. So either they lied when they said he was on the plane, or he was somewhere at the airport. So we hoped anyway. I started to get very anxious. And I couldn’t get any information about what was going on. Just told to wait. Finally! Good news! They found him at the onsite “pet hotel” where animals usually go when in transit or when flying on their own. So we waited for him to baggage claim come in a “few minutes”. When nothing happened, I went back to the counter and asked where he was. She called someone. We waited for their response. By this point, on no sleep and with this added stress, I started crying. My husband was equally upset. I asked if they had really seen him before. Shrug. I asked if he was definitely on the flight. She said it shows two dogs were on it. I asked where the other dog was. Shrug. Could our dog be with the other dog going to who knows where? Shrug. Was he still in Atlanta?! Shrug. I asked for a supervisor. Was told he’d be there in half an hour. !!! In the meantime, I asked for her to pull up our reservation on her computer to see if any notes were in the record. I use the same reservation system (and booked our own flights through it) so I knew how to read the record. I was thinking if he was left in the US, someone may have put something in the reservation. No notes. I was also checking my email and phone messages. Nothing. Eventually the supervisor (shift supervisor) strolled up to see what was going on. The first thing he told us was that he “obviously couldn’t do magic to bring him back”. Yes, he really said that. Nice. He made some calls. Asked the other attendant what she’d done already. Waited for someone to call back. By now, it was about 2 hours after we had landed. Things were looking very grim. We were ready to fly home if anything awful had happened. This was not normal luggage. This was a passenger that was missing and the attitude to find him was very laid back. Like they didn’t really care. We had already gotten our hopes up once that they had him an hour or so ago, so when we were told they did find him, again, we didn’t really believe them. Apparently he had been taken to the pet hotel by the cargo department. How he had security clearance to get there via cargo wasn’t explained. They didn’t know. After an emotional roller coaster for almost three hours, our dog arrived. They did all apologize and let us take him out the kennel. He was fine. Apparently, while we were going through hell, he had a walk and something to eat. We will never forget the ordeal we went through and are very hesitant about flying with KLM to Amsterdam again. We are booked to fly home with them in a few weeks and I’m already nervous. I did a customer complaint and am not satisfied with their standard response. 3,500 Skymiles each. Thanks. It’s not clear who’s fault the mix-up was. But it was not ours. The kennel was clearly labeled with the baggage claim label from the airline, as well as destination and flight information that I always put on the kennel in case of emergency. Our dog was correctly reserved and confirmed. What upsets me the most, from both a traveler and a travel professional perspective, is that an airline that I trusted and I thought previously had really genuinely cared for its passengers (and our “belongings”) has overall just shrugged in response. I’d expect that from some of their competitors, but not from friendly KLM! I know, I know – its been ages since I’ve made a post to the blog. Honestly I was swamped at work (travel agent for humans is my full-time job – pet travel advice is my “hobby”) so I haven’t been writing too much for this blog (see GoYourOwnWayTravel.com or LondonParisAmsterdam.com for my other posts). And we haven’t been doing too much traveling in 2011 – just a couple nights in Sarasota in May (review coming soon!) and that’s about it (Bodie had surgery in May after our vacation and so we took it easy leading up to the surgery and afterwards). But we are now back in Europe for the summer – almost finished with a two week trip through Italy that included stops in Rome, Tuscany, Florence and Venice. We’ll be settling in Amsterdam for a few weeks and I hope to have some free time to update this blog (and my others) then. 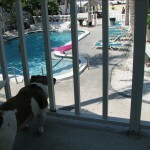 For now, here is a photo of Bodie enjoying the view from our balcony at the Coquina on the Beach in Sarasota – a cute, pet-friendly hotel in a beautiful area. Wishing he was allowed to go for a dip? Actually no - he doesn't like to swim! The following post was submitted by AndASmallDog.com “fan”, Sonja Lishchynski, the CEO of Paws ‘n Cause. She recently traveled with her small dog, Montecristo, to southern Florida. I am proud to mention that AndASmallDog was featured in How To Travel With Pets list of the 5 Useful Pet Travel websites. I also support the list and am big fans of GoPetFriendly.com and DogJaunt.com. Thank, Anil, for the mention! If you are a regular AndASmallDog.com reader, then you already know that I’ve been quiet for the past couple months. There’s a few excuses for this, but the main one is that we weren’t traveling due to a problem with Bodie’s eye. Check out the new issue Fido Friendly! We are pleased to announce that AndASmallDog.com and our campaign, GiveBigDogsABreak.com, have been included in an article in the newest issue of Fido Friendly (in stores now!). Read it online or pick up a copy from your local bookstore! This is a guest post from Mary-Alice Pomputius, who has two blogs. Dog Jaunt offers advice about traveling with a small dog and Pet Carrier Reviews offers unbiased reviews of carriers and crates for dogs, cats and other pets. AndASmall Dog loves reading Dog Jaunt – always something new and informative!